The Vintage Pearl creates unique and meaningful hand stamped jewelry and keepsakes. Each piece is handcrafted from start to finish with care in our studio in Tulsa, Oklahoma. We use raw sterling silver, freshwater pearls and birthstone crystals in our creations. Each letter is individually stamped by hand, we do not use a machine, making every piece a true one-of-a-kind! Our jewelry is customized with any names, dates or words of inspiration, and we have several fonts and charm shapes to choose from. We want your piece to be meaningful to you. We have many unique designs and come out with new designs often. You can also "design your own" hand stamped necklace by picking your favorite shapes and fonts with our eclecticnecklace and our daintyeclectic necklace! We create hand stamped necklaces, bracelets, key chains, leather cuffs, earrings, dog tags, baby spoons and more- the perfect gift for everyone! I was very fortunate to be able to review a love my state necklace from The Vintage Pearl. I love where I am from, sure the city can be loud and crowded and a bit dirty at times… but it is my home and has been for all of my life. Philadelphia is a part of me and it is great that I can show my state pride with my love my state necklace from The Vintage Pearl. When this necklace arrived, it came in a lovely box wrapped with an aqua ribbon with a dangling pearl. It was beautiful and was ready for gift giving. The necklace and the charm were each were very well made. I loved the bronzed antiqued finish that the state charm was made from. And there is a little heart branded into the charm to mark the location of Philadelphia. It was classic, and unique all in one. Sure this is not as personalized like the other items you can get from The Vintage Pearl, but to me to show off my state and city that is special and I love it. If you are not into showing off your state, don’t worry The Vintage Pearl has so very many items you can personalize. Personalized items with your children’s names, birthstones, you can even celebrate your anniversary with your dates and names. There are so many great items to choose from. Even if you do not want a personalized item, if you are just looking for a great looking necklace you can shop at the ready to ship section you can pick up a classic Mom necklace and much more. Do you have a big sports fan in the family, is she very proud of her state and city? Wouldn’t she just love to show her pride for her hometown in a subtle and pretty way? Well a state necklace would make a wonderful gift this holiday season. The I love my state necklace retails for $48.00, and is a great gift idea. So if you are looking for an extra special gift for that special someone this holiday season The Vintage Pearl is the place for you. Great gifts for moms sisters, aunts grandmothers and more! The generous folks at The Vintage Pearl are giving one of Susan’s Disney Family readers a chance to win a love my state necklace. Show off your love for your hometown! Would you like to win? Please check out The Vintage Pearl website, take a look around then come back here and tell me something else you love from the site. There are also other ways to enter please enter below. 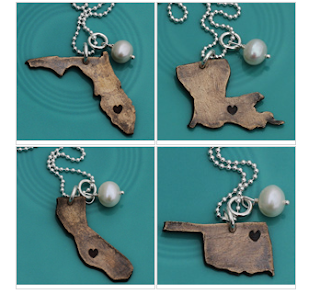 One winner will be able to pick their own city and state love my state necklace from The Vintage Pearl. I love the Sterling Silver Cuff bracelet! My favorite item is the mosaic tile bracelet. I like the Secret Keeper necklace! I love the dainty drop bracelet, so beautiful!! I think the Puppy Love is cute. I like the vintage peas in a pod. "Though she be but little, she is fierce!" LOVE it. I like the "owl" always love you. layered circle of love necklace. I Love You to the Moon and Back Necklace is adorable. I love love love the Beyond the Sea charm bracelet! I literally want every single charm.